As a project administrator, you can save a customization change as a major change or a minor change. The option you select determines if customization is reloaded when a user reconnects after a session expires. Major change (default). When a user session expires and the user reconnects, customization reloads. We recommend that you use this option only for critical changes that must be made available to users as soon as possible. Limiting major changes enables users to quickly reconnect without reloading customization. For example, you might use this option when adding a required user-defined field. Minor change. When a user session expires and the user reconnects, customization does not reload. If at least one major customization change has been made since the last login, customization is reloaded when a user reconnects, for details, see the DISPLAY_LAST_USER_INFO site parameter. This includes all major and minor customization changes that have been made between the last time the user logged in and the current login time. After making changes to Project Customization, click the Return button to exit the Project Customization window. The Customization Changes dialog box opens. 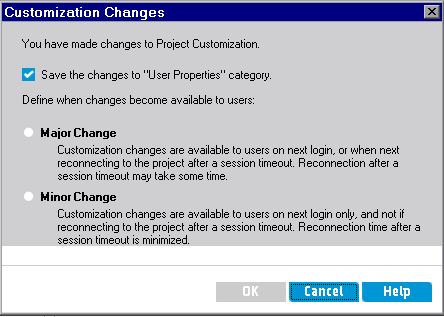 Select a save option and click OK to exit Project Customization and return to your ALM project.